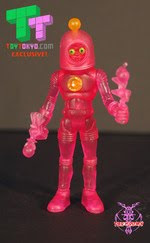 If you collected or read about the original Colorforms Outer Space Men toys, one thing you might remember is that packaged samples of toys that never got made are a big part of it. Thankfully, these new packaged samples of the first four figures are really, honestly coming. They go on sale tomorrow night! After months of pre-paints and rumors, the first look at the final production figures and word on pre-orders are up on the Four Horsemen web site. Figures will be available in pairs for $22 or as a set of four for $40, plus shipping. It's also worth noting that the final painted figures look really good-- considering the asking price and the likely low production run, we're quite impressed. Sales start 6 PM Pacific on Friday of this week. Be ready! 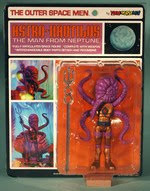 A few minutes late, but still timely, Store Horsemen has the 4 New York Comic-Con Outer Space Men up for pre-order. Only 30 sets are available and it's limited to 1 per person. A set is $40 and $9 for domestic shipping in the United States. Good luck! UPDATE #1: These have since sold out-- by about 6:10 PM. UPDATE #2: On The Forums, the Four Horsemen confirmed the set sold through in 1 minute, 41 seconds. If your order confirmation number ends in 2998 or less, you got in. If not, odds are your order will be canceled. Obviously, watch their forums for more specifics on this issue. And hope they make more to fill the orders with next time. 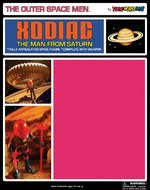 The Four Horsemen added shots of packaged Xodiac in its long-running news rundown on the Outer Space Men line. What's there to say? It's nice. Check it out. 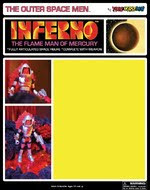 "Just like the Astro-Nautilus & Metamorpho packaging, Inferno's packaging will feature a collector friendly replaceable blister!" If you've collected Japanese figures in the late 1990s (and beyond), you know that this is a real treat! Fans of this line (and retro graphic design) may wish to check out this Metamorpho cardback, which has a lot of great work in it. It turned out well-- but we don't need more description, just go see it. Entering our second week of reposting news, we're thrilled to see The Four Horsemen update with the first-ever packaging photos for the standard edition of their new line-- check out the cardback and cardfront images. Much like the modern 25th Anniversary G.I. Joe line as well as Hasbro's various retro Star Wars series, they bring the old style to life while also bringing in a few modern touches. It looks really sharp, and explains just what the heck these things are. We approve. 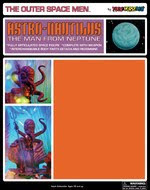 Astro-Nautilus is the only one on display so far, but hey-- gotta start somewhere. Also, it looks like they may be available by October/November, which is fantastic news. 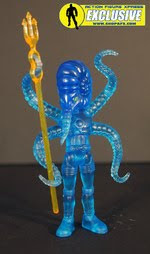 NYCC Beta Wave Nautilus or Astro-Nautilus? The blue Beta Wave Astro-Nautilus was revealed today to be clear blue and pretty darned swell. The Alpha Wave version was clear purple. Limited to 330 pieces, it will be paired with the Beta Wave Inferno figure and sold via Action Figure Xpress at New York Comic-Con for $24 per set. 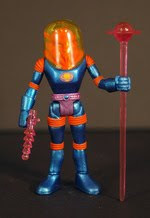 The next New York Comic-Con exclusive figure from Outer Space Men is Xodiac! 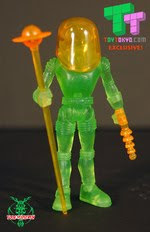 The Man from Saturn is now green, rather than orange or the final production figure's colors. His gear comes in orange, and he's pretty striking in a sort of an Ecto-Cooler kind of way. The Four Horsemen also revealed that this Toy Tokyo exclusive will be paired with Metamorpho and sold for $24. There will be 330 sets. 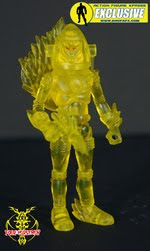 Next up on the announcement parade is Beta Inferno, a yellow prepaint of the upcoming figure from The Four Horsemen. This New York Comic-Con exclusive is also limited to 330 pieces and will be sold at the Action Figure Xpress booth-- AFX had the Alpha wave at San Diego Comic-Con earlier this year. A limited number of these will be sold online, but at 330 pieces, well, don't get your hopes up. Seen here is the Toy Tokyo exclusive Metamorpho which will be limited to a puny 330 pieces. Sold at New York Comic-Con later this year, it'll probably be $10-$15 and sold with a yet-to-be-revealed second figure. But we're waiting for more on that. 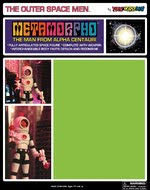 The Alpha Wave Metamorpho was sold at San Diego's Comic-Con International and was cast in glow-in-the-dark plastic. This one is clear red, and quite striking. The Four Horsemen celebrated Labor Day in the USA by working. Specifically, by posting a press release with details of their new exclusives-- no pictures are available yet but they mentioned in their forums they could be up as early as this week. These "Beta Waves" are notable in that they are the second set of "prepaints" before the real figures are made... and when will this be? No idea. But for building hype, this company seems to be doing a great job of ensuring fans will have to do some work to get these. For more details, consult their press release and stay tuned here for more!